With ballots hitting mailboxes this week, a new Consumer Energy Alliance (CEA) report adds to the already overwhelming list of evidence that passage of Proposition 112 would be devastating for Colorado. The report finds that low natural gas prices – made possible in part by record shale-driven state production – saved Coloradans nearly $12.4 billion from 2006 to 2016. However, should Prop 112 pass, the report concludes natural gas prices would increase significantly, a development that would impact low-income households the most. The report finds that lower natural gas prices from 2006 to 2016 saved Colorado households $4.3 billion. The billions in savings can be traced to the fact that seven out of 10 Colorado households rely on natural gas as their primary heating source. 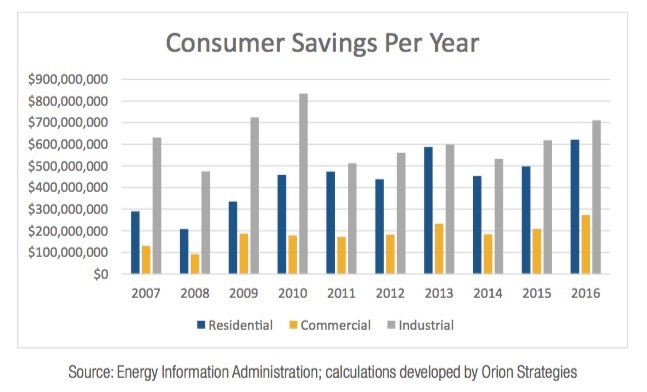 Natural gas has also emerged as a major electricity generation fuel in the state over the last decade, driving down electricity bills. CEA also finds that affordable and abundant locally produced natural gas helped save the Colorado commercial and industrial sectors $8 billion from 2006 to 2016, driving jobs and economic growth. But the report finds Prop 116 – which would impose 2,500-foot setbacks that would all but ban new oil and gas development in the state – not only threatens these continued savings, but also the 232,000 industry-supported jobs and critical tax revenue streams fueled by the $31.4 billion the oil and gas industry generates annually in the state. At risk are 56 percent of local tax revenues (totaling $200M) in the first year alone, and potentially $1B by 2030. The report also notes that 60 percent of school funding ($230.3M) could be lost over a three-year period, according to a State Land Board estimation. “Colorado has fast become one of America’s leaders in safe, economical oil and natural gas production, rejuvenating communities statewide and helping families and businesses of all sizes reduce expenses, growth and prosper via abundant sources of locally-made, affordable energy. This is the fifth CEA report in the past few months finding low natural gas prices are saving residents of major shale states billions. All told, CEA’s recent reports on Pennsylvania, Ohio, West Virginia, Texas and Colorado find savings totaling more than $146 billion.